Setting the scene. Life on the Rabbit Proof Fence. The following information on the Rabbit Proof Fence has been obtained from “ Murder on the Rabbit Proof Fence” The Strange Case of Arthur Up Field and Snowy Roles, Terry Walker (1993). A great read. AND “ The Longest fence in the World “, F. Broomhall. Both are published by Hesperian Press and available for purchase at the Visitor Centre. The Rabbit Proof Fence was conceived in an attempt to prevent rabbits entering the agricultural areas of the State. And what a fence it was! When finished it stretched 1,827 kms from near Hopetoun in the south to Cape Kenaudren, north of Port Hedland. Work commenced at Burracoppin in 1902 and that town was a major depot for the boundary riders employed to maintain the fence. Gates through the fence were numbered in miles from Burracoppin. There were heavy penalties for travelers caught leaving the gates open (72 days in prison if the fine was not paid) and for anyone found traveling along the fence maintenance track (100 pound fine). 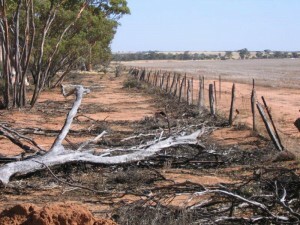 A fence west of Fence No 1 was constructed later and its line is crossed just east of Cunderdin on Highway 1. 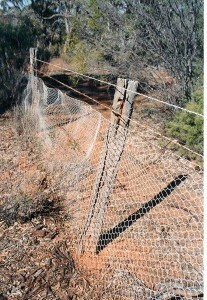 No 3 fence was later built out of Geraldton to meet No 2 fence and deter emus from invading the agricultural areas. As a fence runner Arthur Upfield had to look after 163 miles of fence line from Camel Station to Burracoppin. He had a dray pulled by two camels. The pace was slow. Upfield would walk along side the dray. He had to clear fallen trees, replace rotted fence posts and repair damage to the netting. Water was obtained from wells and an occasional rain tank (14 mile gate). It was virgin bush most of the way. The first sign of farming country was about 60 miles from Burracoppin and the first road crossed the fence 40 miles out. On reaching the town he would spell the camels at the Government farm, spend two days in the town then start north again on the 14 day return trip. Another Fence runner Arthur Grundy, conceived the idea of the charity the Silver Chain. He was inspired by the sun shining on the silver chain of his watch as he sat in his camp 133 miles south of Burracoppin in 1904. Since 1905 the Silver Chain have been helping the sick and needy in both the city and the country. The Rabbit Proof Fence No.2 runs north/south through the eastern third of the Dowerin shire. It was built in 1907-1908 and much of the fence remains in good condition. Mile posts mark the distance from the south coast. The fence originally went from Point Anne to north of Cue, where it turned east to join Rabbit Proof Fence No.1 at Gum Creek.